Having a New Year’s Eve party this year? 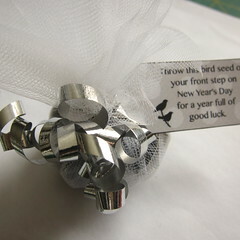 Why not send your guests home with something besides a hangover, like a little luck for the new year. I’m not sure where this tradition came from, but every year Matt’s mom gives us a little package like this. On New Year’s morning we toss the birdseed inside on the front porch. So far, all our years together have been pretty darn lucky. 1. 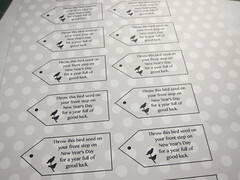 Download the New Year’s Party Favor Tags and print as many as you need on cardstock or scrapbook paper (you might need to cut the scrapbook paper to letter size). Cut out the tags. 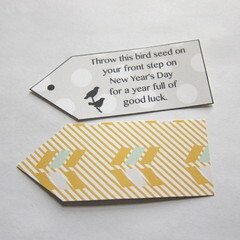 I used scrapbook paper with a pattern on both sides which made for an even nicer tag. 2. 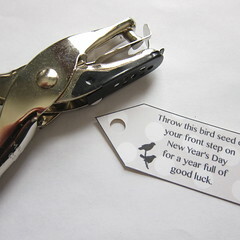 Use a hole punch to punch holes in the tags where marked. 3. 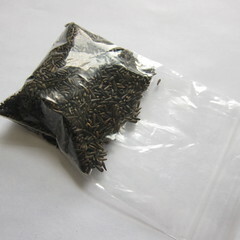 (Optional step) Put 2 – 3 tablespoons of birdseed into each of the small plastic bags. 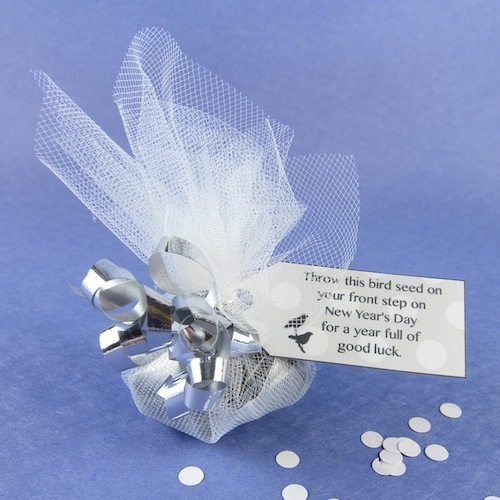 You could skip this step and just put the seeds directly in the tulle, but I though people would be more likely to spill it when opening the favor that way. 4. Cut the tulle into as many 14″ x 7″ squares as you need. Fold each square in half creating a 7″ x 7″ square. 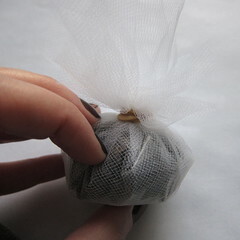 Put the birdseed on the middle of the square and pull the sides up around it. Secure with a rubber band (the rubber band is optional, but I found it easier to tie the ribbon on if the tulle was held together). 5. Put the tag on a piece of ribbon and tie over the top of the rubber band. 6 years ago by Kat in Craft Projects , Crafts , Holiday , Holiday Parties , Parties , Projects | You can follow any responses to this entry through the RSS feed. You can leave a response, or trackback from your own site. 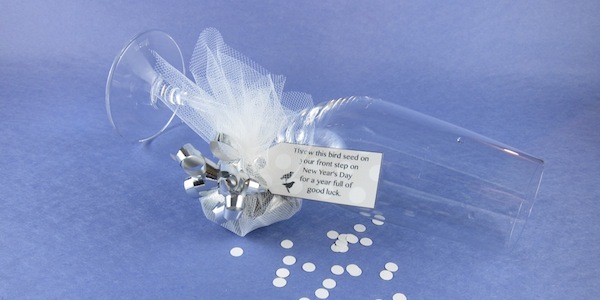 Such a great idea for party favors! You can just change the contents of the tool to fit your theme like for valentines. You can just change it like to heart shape designed sprinkles. The idea originally came from a local store, Wild Birds Unlimited. It was an extra with a Christmas gift that we had bought. Over the years we have changed it between Christmas and New Years, depending on when we would be seeing family.